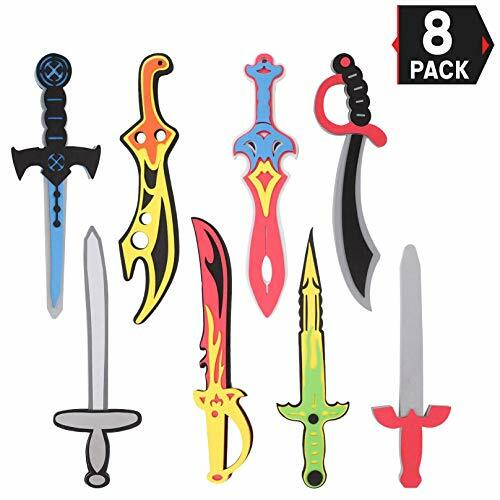 ✅ COLORFUL: Fun Set of 8 Foam Swords. A set of stylized toy foam swords kids toys for fun medieval play time. ✅ VARIETY: 8 Unique Sword Designs - Ninja, Pirate, Warrior and Viking swords. Makes for an imaginative outdoor playtime at home, rainy day activities, Birthday party games, and a Halloween costume party. ✅ PERFECT SIZE: Swords Each Measure between 15" to 17" in Length. Comfortable, light weight and safe for small children to play with. Recommended for Ages 3 and Up. ✅ SAFE & DURABLE: Comfortable and Safe for Small Children. CPSC Tested and Certified. Light weight and soft enough for play fight battles since the toy swords are made of thin layered felt material. Slash the competition with these active fun toy foam swords. ✅ IDEAL GIFT: These kids toys are perfect for school plays, theater props, pirate halloween costumes, and party favors. Compliments a child's pirate costume as the main accessory. Make them the go to party games for child's play activity toys.